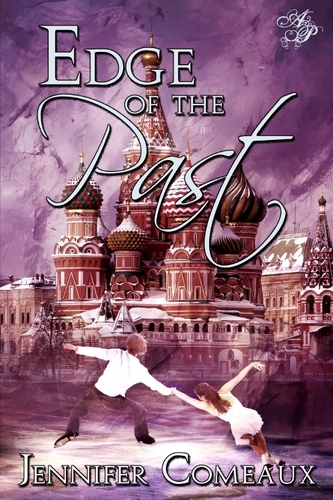 Edge of the Past was the sequel to the young adult, contemporary novel Life on the Edge, by Jennifer Comeaux. It took me a while to get around to reading it due to a full review schedule, but when I did, I found it to be almost impossible to put down! I was so much more engrossed in this book than I was in the first, mainly because the drama was thicker, and the romance between Sergei and Emily was even more intense. I loved the plot twists that Ms. Comeaux constantly threw in, and found Edge of the Past to be a very well written, absolutely perfect second book to this beautifully told series. Emily and Sergei are finally together, and their life seemed to be almost complete as they prepared for their coming marriage. But then Sergei’s past came back to haunt the both of them during their stay in Sergei’s homeland of Russia, and their relationship, as well as Emily’s skating career, began to suffer due to some unexpected events that occured. Was their love able survive these new turn of events, or were the challenges they faced too much of a burden on their love to take in the end? I’ve stated before how much I truly enjoyed these characters, but I believe Emily became my favorite over all in this series after reading Edge of the Pase. She grew up so much from book one, and handled everything that was thrown at her with such grace and dignity that I really came to admire her in the end. I can’t exactly explain why this was without giving away spoilers, but I will say I definitely looked at her in a new, admiring light in the end. Sergei frustrated me somewhat in Edge of the Past, but still, his love and devotion for Emily shown through in the end. The two of them went through quite a change in this book, but I will say I love them more now then I ever did in Life on the Edge. I was stalking out Ms. Comeaux’s blog and was excited to see that she had written a third short story for this series, and now that a I know that it’s available, I am so excited to read it! But with that being said, readers will surely still feel completed by the time they reach the end of Edge of the Past. Edge of the Past was so sweet, that my cheeks hurt from smiling so much when I reached the end. Ms. Comeaux has really outdone her self with this book, and she definitely has a fan for life in me! I highly recommend this series, but do know that Edge of the Past really can’t be truly enjoyed unless you read Life on the Edge, first. It’s a perfectly sweet, young adult novel that will leave you needing more, but will still leave you equally just as satisfied. Well done Ms. Comeaux, Edge of the Past was certainly an outstanding read!